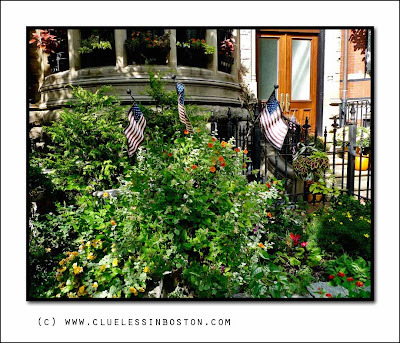 Early Autumn garden and doorway; seen on Beacon Street. Maybe you don't realise it, but having flags in one's garden is also something very american. We don't do that here. Beautiful and those flags are a neat detail! I love the point of view you've chosen here, with the door in the background and that lush green growth as the focus. That must be such a special room behind those windows. And a very patriotic one! Well... I thought it was you. ;-) This is a very nice WD shot, because there's more to it than just a doorway, so much green and little flags!